Who “owns” oral history? When an oral history narrator shares her story in response to questions posed by an interviewer, and the recording and transcript are deposited in an archive, who holds the rights to these historical source materials? Who decides whether or not they may be shared with the public, quoted in a publication, or uploaded to the web? Who decides whether someone has the right to earn money from including an interview in a commercially distributed book, video, or website? Furthermore, does Creative Commons, a licensing tool developed by the open access movement to protect copyright while increasing public distribution, offer a better solution to these questions than existing oral history protocols? Jack: In the mid-1990s, I began to conduct oral history interviews for my dissertation research on African-American school reform activists in Milwaukee. 5 I recorded interviews, followed standard protocols for consent forms and institutional review, and made good on my promise to transcribe and return a free copy of the tape and transcript to each of the sixty participants who kindly shared their history. But the “best practices” in the field left me feeling unsatisfied. Originally, I had been drawn toward oral history and public history as means of community empowerment on civil rights history, but the standard guidelines required me to ask people who freely offered their stories to sign away some of their rights. At that time, my reference guide for consent forms was the Oral History Association’s pamphlet by John Neuenschwander, Oral History and the Law, which has since been expanded into a book. 6 On the legal question of ownership, as soon as the interview is recorded, the oral history narrator initially holds the copyright, but standard practice is to prepare a consent form to transfer away those rights. As Neuenschwander explains, ”The vast majority of oral historians and programs at some point secure the transfer of the interviewee’s copyright interests by means of a legal release agreement,” and offers sample language in the appendix. 7 Similarly, the Oral History Association’s 2009 statement on “Principles and Best Practices” fully expects oral history participants to sign over their rights as part of the standard procedure for conducting interviews: ”The interviewer should secure a release form, by which the narrator transfers his or her rights to the interview to the repository or designated body, signed after each recording session or at the end of the last interview with the narrator.” 8 As I understood copyright law, since I wished to create a transcript of the interview and freely quote from it in my scholarly writing, the transfer of copyright away from the narrator was in my best interest. I agree to be interviewed and tape recorded by Jack Dougherty, as part of his dissertation research on the recent history of African-American education in Milwaukee. At the end of the research project, the original tapes and edited transcripts will be donated to the Milwaukee Urban Archives at University of Wisconsin-Milwaukee and the Wisconsin Black Historical Society/Museum. These materials will be identified by my name and made available to the public for scholarly and educational purposes, unless exceptions are listed below. . . . I also grant to Jack Dougherty any title to copyright, property right, or literary rights in the recording(s) and their use in publication, as well as to any reproductions, transcripts, indexes, or finding aids produced from the recording(s). My participation in this project is entirely voluntary, and I may withdraw at any time prior to its conclusion and the donation of the materials to the Archives. Yet I was frustrated with this language about copyright transfer. In my eyes, the wording was a necessary evil to preserve these valuable oral histories in a university archive (whose staff at that time coached me on the consent form) and to allow me to quote extensively from them in my eventual book (as required by my publisher’s copyright permissions process). Understandably, many Black Milwaukeeans were highly skeptical or hesitant when I explained the terms of the consent form. Several expressed deep concern that it asked them to sign away their life stories, which I assured them was not the case. A few agreed to be interviewed but did not sign the form. A few others refused to be interviewed at all. One persuaded me, after our interview, to write up a special consent form that preserved her copyright and granted me permission to quote specified passages in my writing, but did not extend any rights to others, such as the archives. Eventually, over sixty oral history participants did agree to sign my consent form, for which I was grateful. Some signed in exchange for a free copy of the recording and transcript as a contribution to their own family histories. Others were motivated by the public good of preserving and sharing their civil rights stories through one or both of my archival partner organizations. Together, all of these conversations challenged me to think more deeply about who benefitted from this contractual arrangement. If activists freely shared their civil rights stories with me, did I have the right to profit as a professional historian? The process expanded my thinking about oral history and the public good, and upon receiving an academic book contract, I returned my share of royalties (and later, prize money and speaking fees) back to the Wisconsin Black Historical Society/Museum to continue their public history work. Given my understanding of oral history and copyright law as a graduate student in the mid-1990s, this was the best user-friendly consent form I could envision. Looking back, there were some alternatives that deserved more consideration. For instance, I could have expanded on the copyright transfer language by adding a line that retained the narrators’ rights to utilize their own interviews during their lifetimes. 9 But adding this clause fails to address the underlying issue of transfer of ownership of copyright away from the narrator, and out of their family’s hands at the end of their lifetime. Another alternative I could have explored further was to ask narrators to make their interviews part of the public domain. But this option would have gone to the extreme of eliminating all of their rights under copyright law, and furthermore, at that time I could not find useful examples of this approach by oral historians. 10 Under these circumstances, this mid-1990s consent form was the best I could do at the time, yet it left a bitter taste and a strong desire to find a better model in the future. I voluntarily agree to be interviewed for this historical study . . . I understand that my interview (and other items above) may be distributed to the public for educational purposes, including formats such as print, public programming, and the Internet. Also, I agree to freely share my interview (and other items above) under the terms of a Creative Commons Attribution-NonCommercial-ShareAlike 3.0 Unported License. This means that I retain the copyright, but that the public may freely copy, modify, and share these items for non-commercial purposes under the same terms, if they include the original source information. In return, the interviewer promises to send one free copy of the interview recording, transcript, and related items to my address above. We prefer the Creative Commons (CC) consent form because it clearly keeps the copyright in the hands of the oral history interview participant, but allows us to freely share the recording and transcript on our open-access public history website and library repository, where individuals and organizations may copy and circulate it, with credit to the original source. For our oral history consent form, we added a NonCommercial restriction, to ensure participants that no one can profit by selling their interviews. 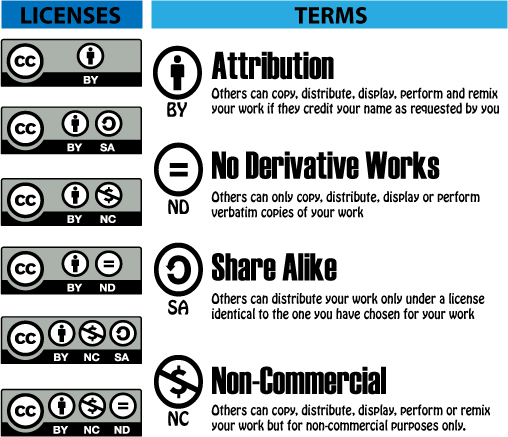 As the Creative Commons “Frequently Asked Questions” section clarifies, once a CC license is applied to a work, it cannot be revoked, but all CC licenses are non-exclusive, meaning that the holder of the copyright (in this case, the interview participant) may grant additional licenses to other parties (such as a for-profit book or movie, if desired). 11 Also, CC licenses do not limit “fair use” provisions of existing U.S. copyright law, meaning that commentators have the same rights to report on or quote from the original work. Furthermore, CC licenses are increasingly used by leading knowledge-based institutions such as the the Massachusetts Institute of Technology (MIT) OpenCourseWare project and the Public Library of Science (PLOS). Overall, we believe that this combination of intellectual property tools — traditional copyright with Creative Commons licensing — fits better with our primary goal of historical preservation and public education than does traditional copyright alone. In Hartford, a specific oral history interview we conducted with school integration activist Elizabeth Horton Sheff deserves mention, because she took our Creative Commons consent form one step further by renegotiating its terms, just before we began our video recording. Sheff agreed with our goal of preserving her oral history for the public good, but her primary concern was to avoid being quoted out of context, as she had experienced with journalists in the past. She wanted her oral history interview to be made available in its totality on the web, but not to allow others to create a modified or excerpted version. Fortunately, Sheff was familiar with Creative Commons because her son is in the independent music business. She asked for a “no derivatives” restriction, and on the spot, we modified the consent form license to the ByAttribution-NonCommercial-NoDerivatives CC license. As a result, her video recorded interview and transcript both appear in the Trinity College library digital repository, but to respect her restriction, we blocked the ability of users to download their own copy of the video (to make it harder to create an edited version). 12 Still, anyone can move the video time slider on their web browser to watch only a certain portion if desired (such as minutes 28 to 32). Furthermore, anyone may download the transcript of the interview, and quote from the text under “fair use” guidelines. 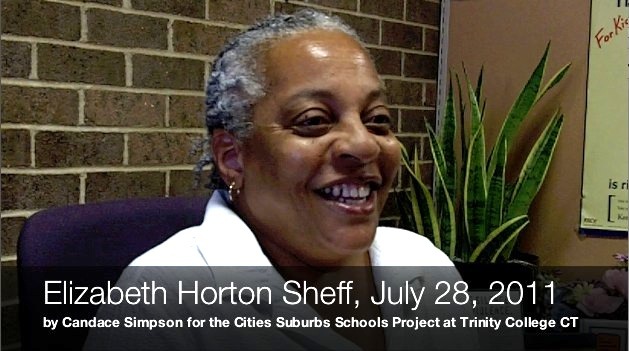 Click to view Elizabeth Horton Sheff oral history video interview and transcript in new tab. We do not contend that Creative Commons has resolved all of our questions about who “owns” oral history, nor do we claim expertise in intellectual property law. But as oral historians seeking alternatives, we believe that this combination — traditional copyright with Creative Commons licensing — fulfills our dual needs to maintain the rights of individual participants while sharing history with the public. We invite you to write questions, comments, or offer other examples of oral history projects using Creative Commons licensing. This essay originally appeared in Jack Dougherty and colleagues, On The Line: How schooling, housing, and civil rights shaped Hartford and its suburbs (Hartford, CT: Trinity College, Fall 2011 web-book), http://OnTheLine.trincoll.edu, and is shared under a Creative Commons BY-NC-SA license. Dougherty, J. & Simpson, C. (2012). Who owns oral history? a creative commons solution. In D. Boyd, S. Cohen, B. Rakerd, & D. Rehberger (Eds. ), Oral history in the digital age. Institute of Library and Museum Services. Retrieved from http://ohda.matrix.msu.edu/2012/06/a-creative-commons-solution/.